As you may know, I’ve been trying to catch up on getting all the posts out from our recent vacation to France, Germany, Austria and Slovenia. It’s been slow. Too slow. There is so much I want to share with everyone, yet so many times I sit down to write and I look at the screen and think…boooooriiiing! Especially since half our trip was just seeing friends and doing the everyday things we liked doing before. Not exactly what everyone will want to do or care about if they take their own vacation for just a week or two. While the type A side of me wants everything in chronological order, my creative side says, “Just put up the exciting stuff now!” So this is my compromise with myself. A full snap shot of our month away in Europe without so many boring words that will then allow my type A side the freedom to elaborate on the more interesting parts of the trip as I see fit in future posts. I hope you will enjoy and maybe even post a comment letting me know which pictures you found the most intriguing and would like to know more about? Day 1: Arriving in Frankfurt and Bonn (Alfter), Germany on August 1st. 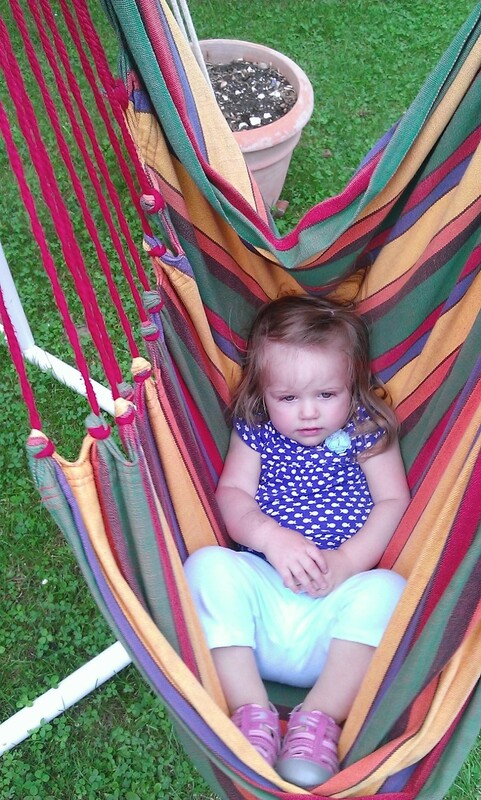 Getting comfortable with new surroundings. Day 2: Adjusting to the new time zone, playing at the neighbor’s house and a little shopping in Bonn. 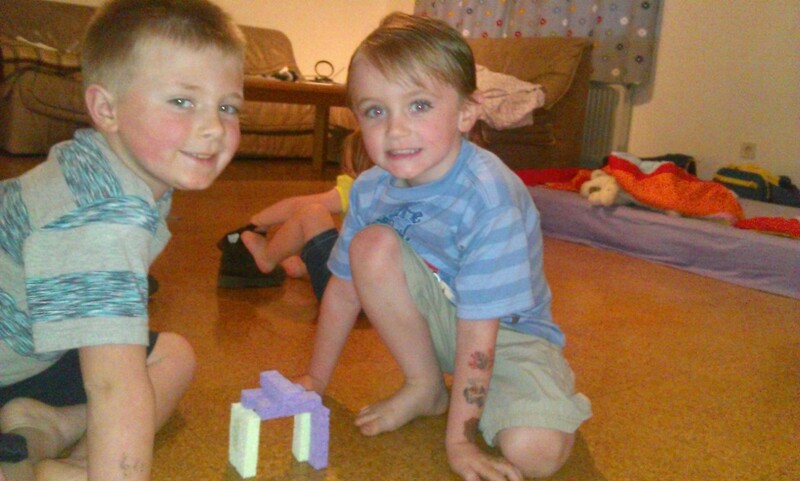 Keeping the kids occupied at 3:00 am local time while the rest of the house is fast asleep. Day 3: More time with old friends in our village and our old neighborhood playground, a trip to the Waldau in Bonn. 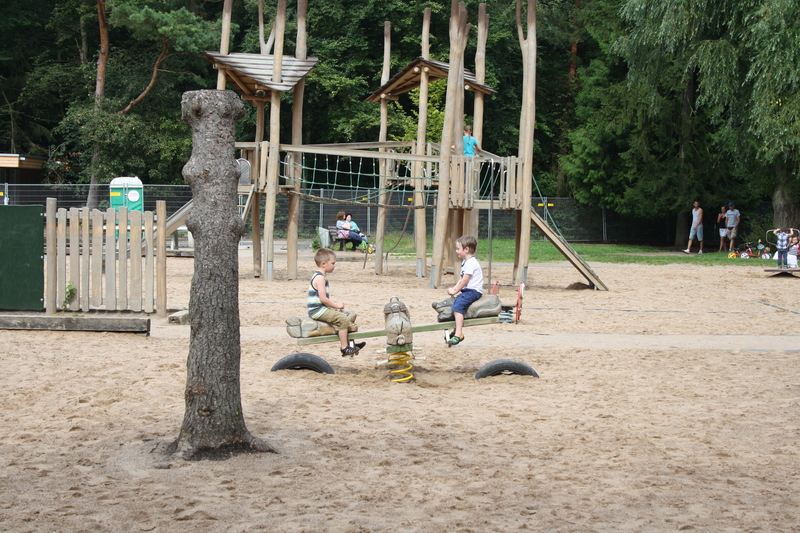 The Waldau has one of Bonn’s biggest playgrounds and animals too! Day 4: A trip to the Rheinaue park in Bonn and later spending time with friends who became our family and enjoying a nice Rheinish meal. Homemade reibekucken by our adoptive “Oma and Opa” neighbors. 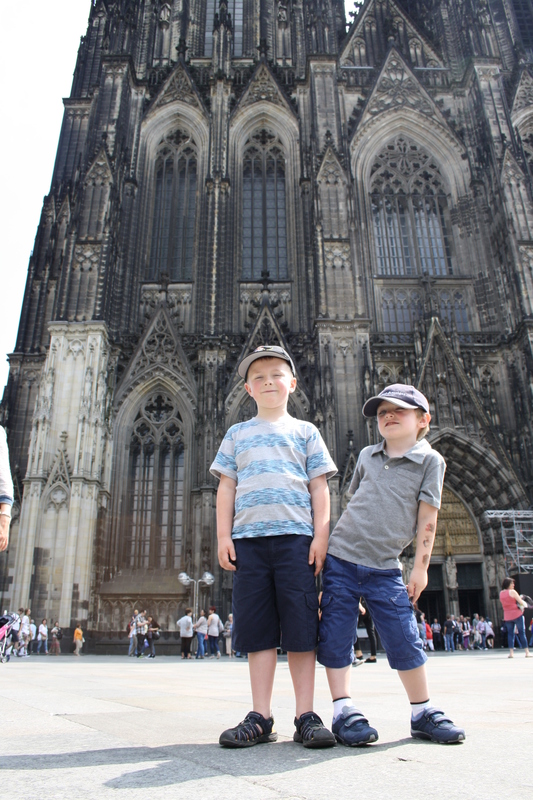 Day 5: We traveled by the little regional train into Cologne to revisit the Dom, and go to the Chocolate Museum and Olympic and Sports Museum. The Cologner Dom! So big it’s hard to fit it all in a single picture. Day 6: One last visit with friends in the city center of Bonn before taking the train to Berlin, Germany. 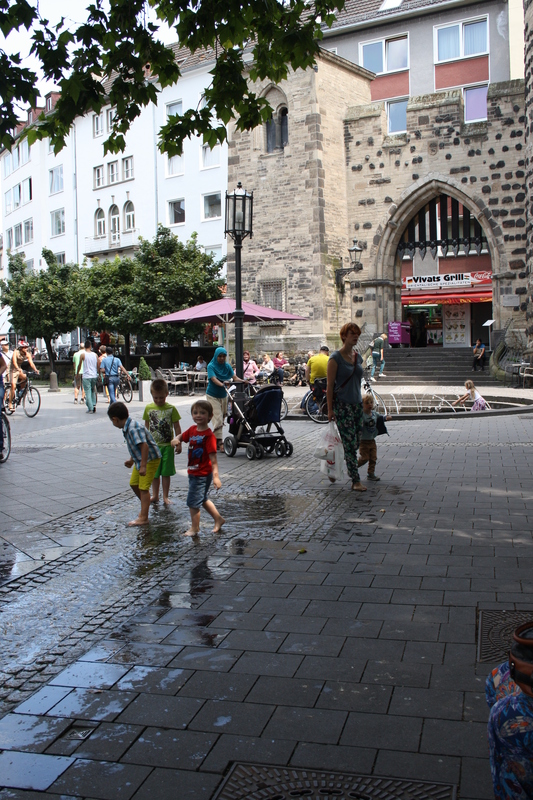 Water and playground fun in front of one of Bonn’s old city gates. Day 7: Woke up in Berlin after staying in my first ever hostel. 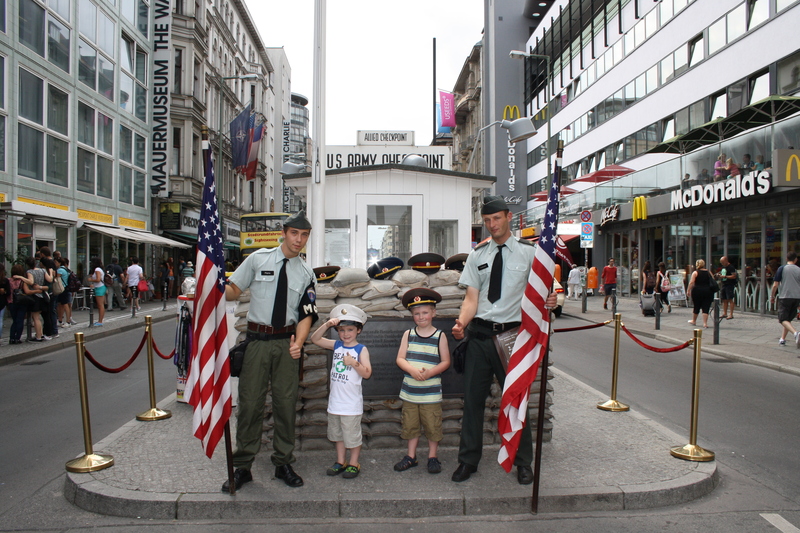 First stop was Checkpoint Charlie followed by a hop on hop off tour of the city. Had to pay 2 Euros for a picture, would have been another 2 Euros for me to be in the picture with my kids! Day 8: More Berlin sight seeing. 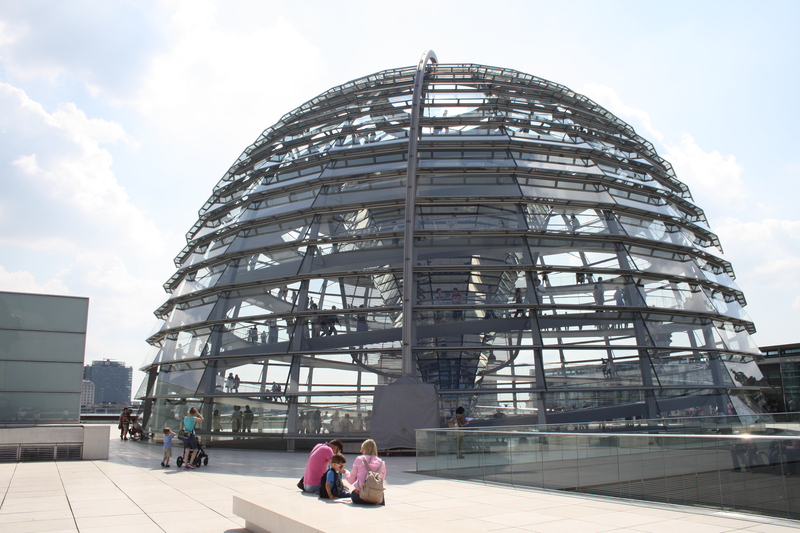 The cathedral, museum of the former DDR and the Reichstag building. The dome on top of the Reichstag, we took the circular ramp up to the top inside the dome. Day 9: Said good-bye to our former neighbor girl and toured Potsdamer Platz, Legoland Discovery Center and did some shopping. 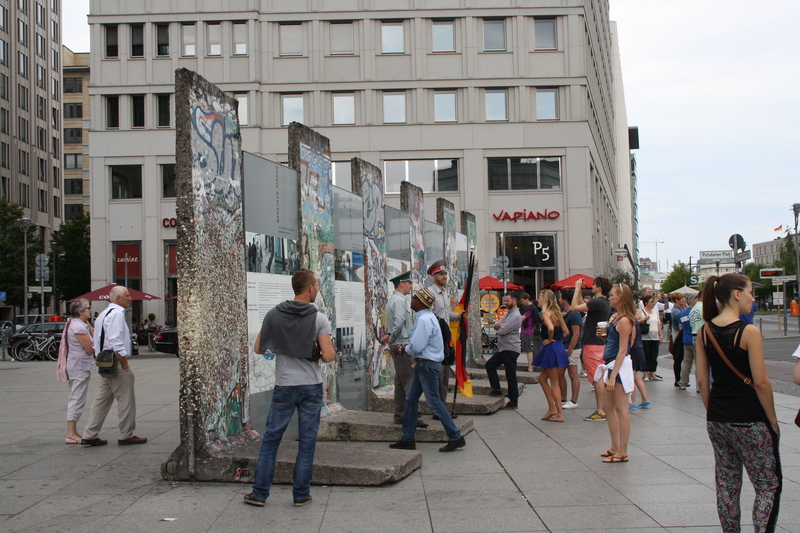 A portion of the Berlin Wall at Potsdamer Platz, showing where the boarder actually was. 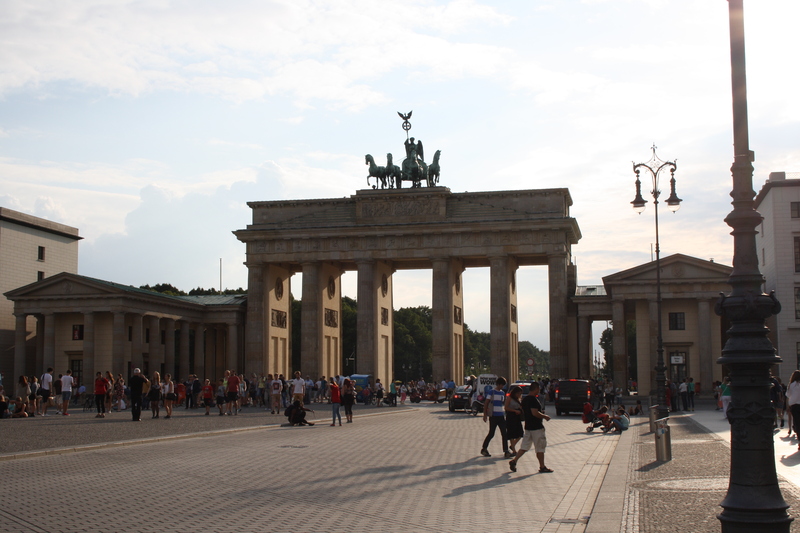 Day 10: Went to the famous Fassbender & Rausch Chocolatiers, walked through the Brandenburg Gate again and to a playground in the Tiergarten before hopping on another train, this time to Munich, Germany. Day 11: Woke up in our beautiful old neighborhood of Bogenhausen in Munich. Took a stroll around our old stomping grounds and ate with friends. Our old apartment on Prinzregentenstrasse, Munich. Day 12: Repacked for our flight to Paris that evening. And went through our old neighborhood again to met up with some friends at a playground before making a MAD dash to the airport to fly to France. I actually took NO pictures this day, somehow, so here is one from a different day in the same area that we walked around. 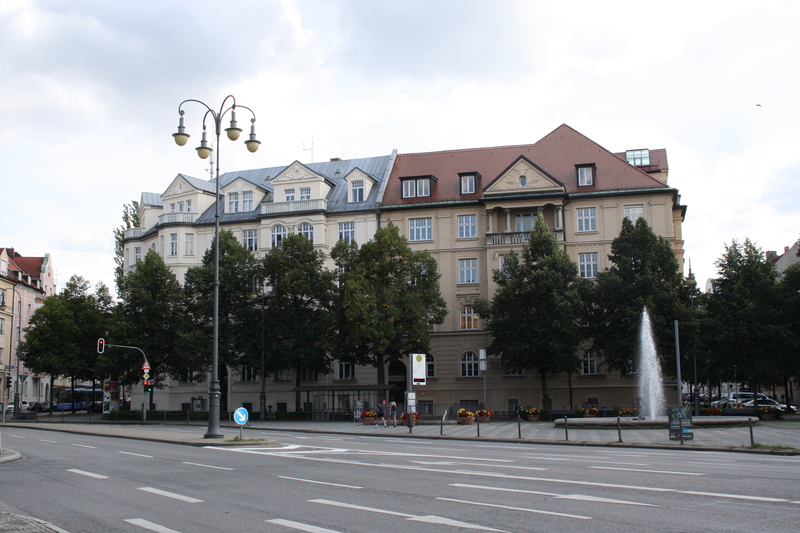 Prinzregentenplatz and building that was once Hitler’s Munich residence. Now a police station. Day 13: Woke up to our first day in Paris. 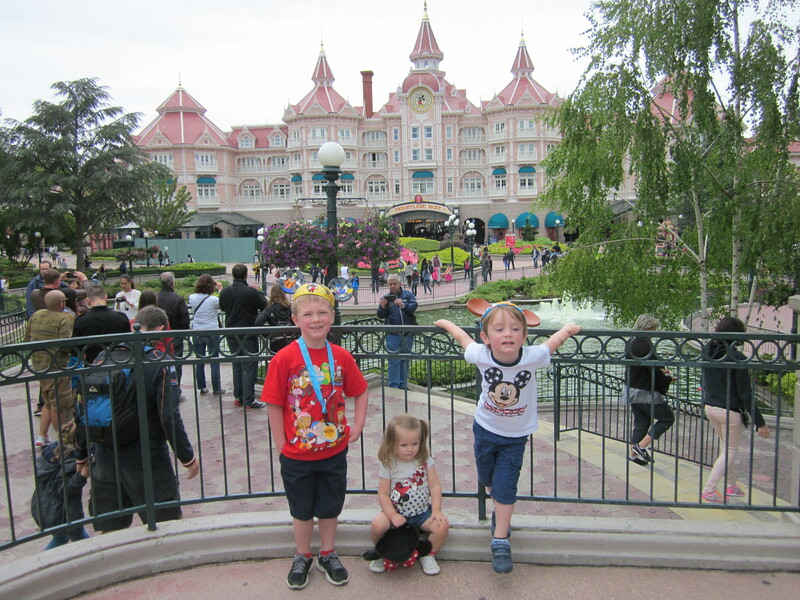 Decided to give the weather a try and took the 3 kiddos to Disneyland Paris! We got rained one twice. Day 14: Out and about in Paris! 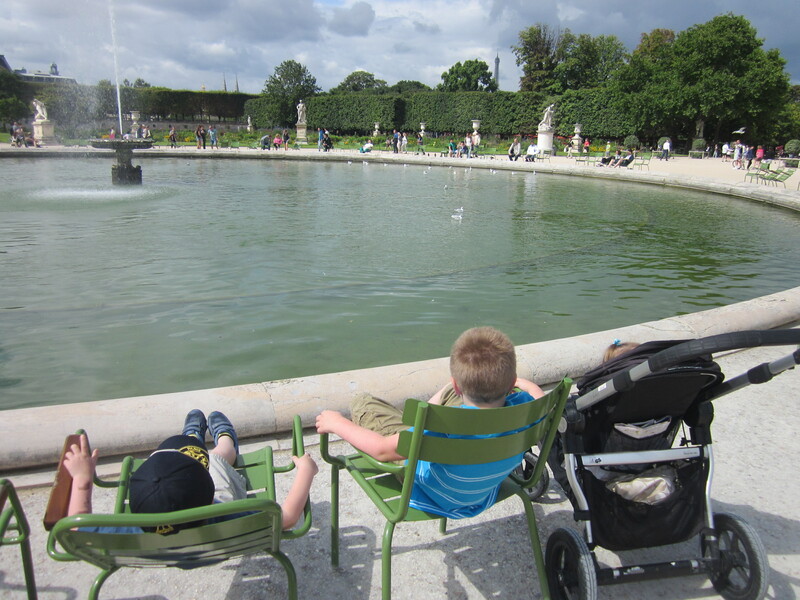 We started in the Tuileries Garden and went to 6 other playgrounds around Paris from there! Taking in the view of the Eiffel Tower from a seat in the Jardin des Tuileries. Day 15: Went to the Champs Elysee and 5 more playgrounds! 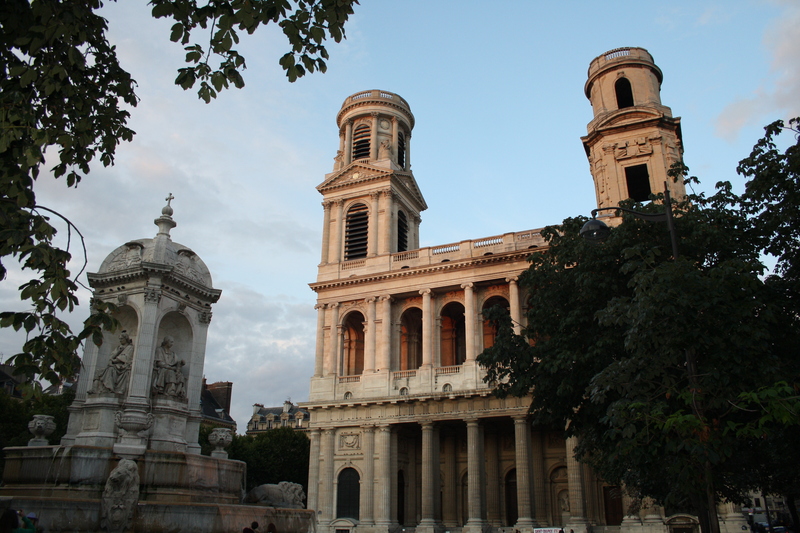 Best sights in between were the Jardin du Luxembourg and the Saint Sulpice. Day 16: Flew back to Munich from Paris at 7:00 o’clock in the morning. 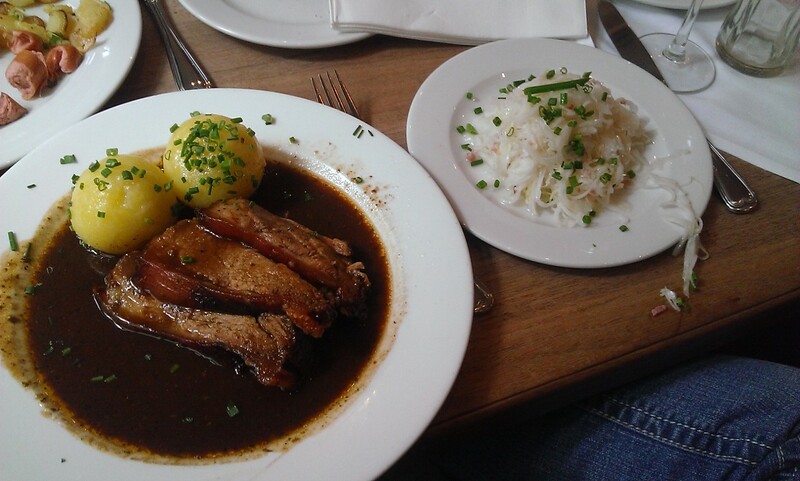 Then had some delicious Bavarian food with friends in the Munich city center. Scweinbraten at Paulaner im Tal Bräuhaus. Day 17: Attended our former church, Peace Church. Then met with our friends for some “mini-golf” at the Olympia Park while waiting for my husband’s flight to land. He got to join us for one week of the month. The Olympia Tower, Munich Germany. Day 18: Breakfast again with friends, then packed up for a week in Austria and Slovenia. 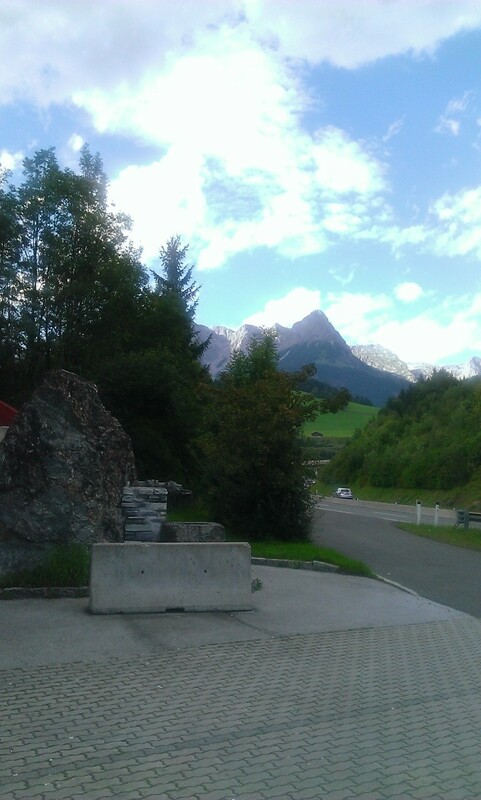 Drove to Sankt Johann im Pongau, Austria. Even the rest stops in Austria are pretty! Day 19: Went off to explore the Pongau area and the castle and mountains of the small town of Werfen with my husband. A truly wonderful place for kids and adults! Day 20: One of the most intense and beautiful days of the trip! A hike up a mountain to the world’s largest ice cave! 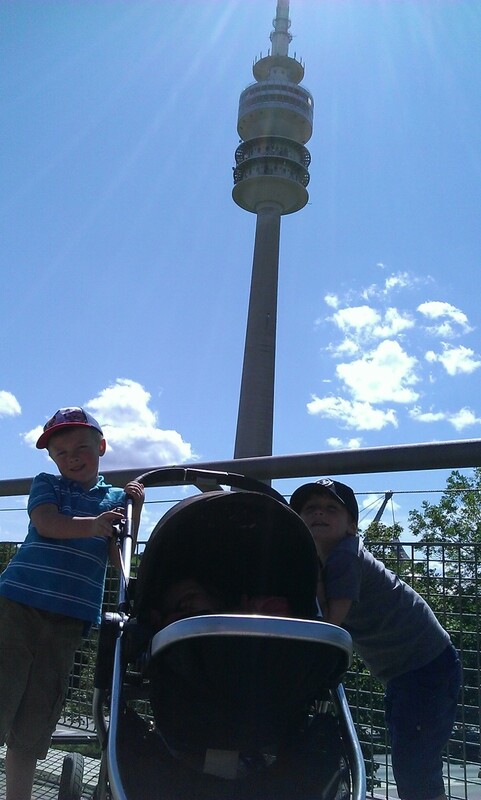 At the Eisriesenwelt! I could not have done this activity with the 3 kids alone. Here is a postcard purchased from the site. No cameras were allowed in the cave. 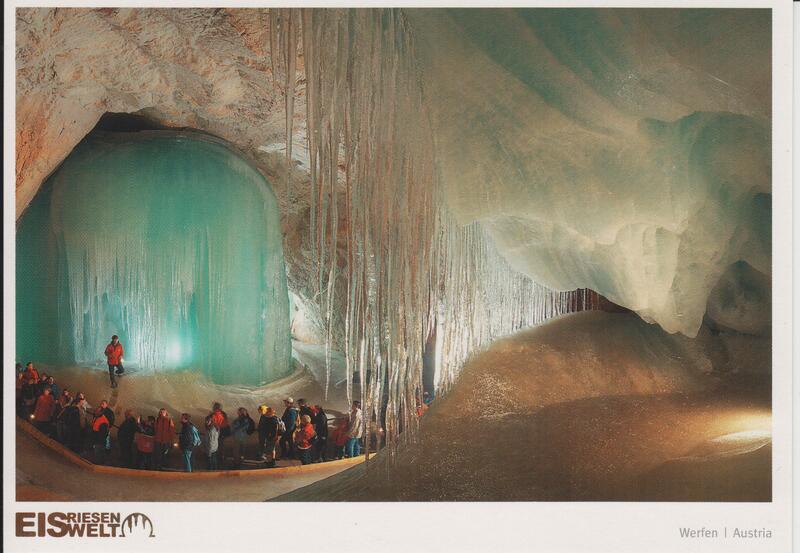 Photo credit: Verlag Eisriesenwelt GmbH. Day 21: Our last day in Austria. 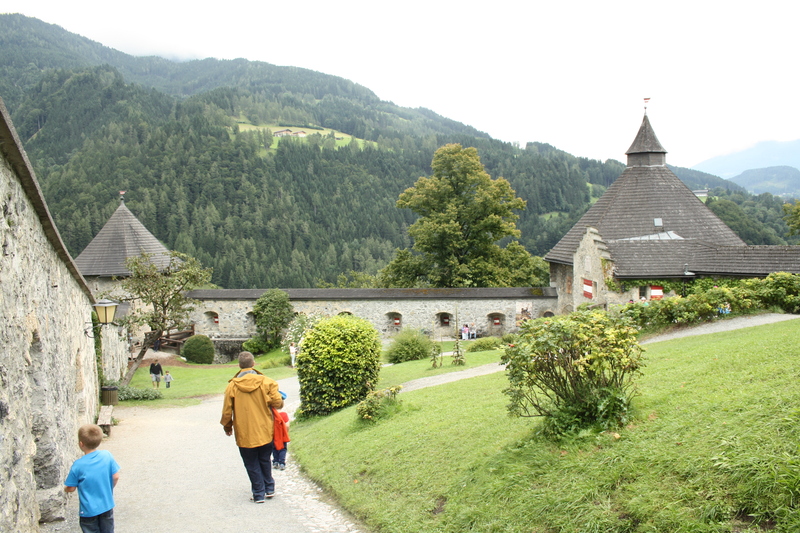 Went to Sankt Johann’s Alpendorf and explored the ghost themed, yet child centered, Geisterdorf and playgrounds. Then walked along the breathtaking path through the Liechtensteinklamm, one of the longest wild river gorges that you can walk through in the alps. From there we drove to our next hotel in Ljubljana, Slovenia. 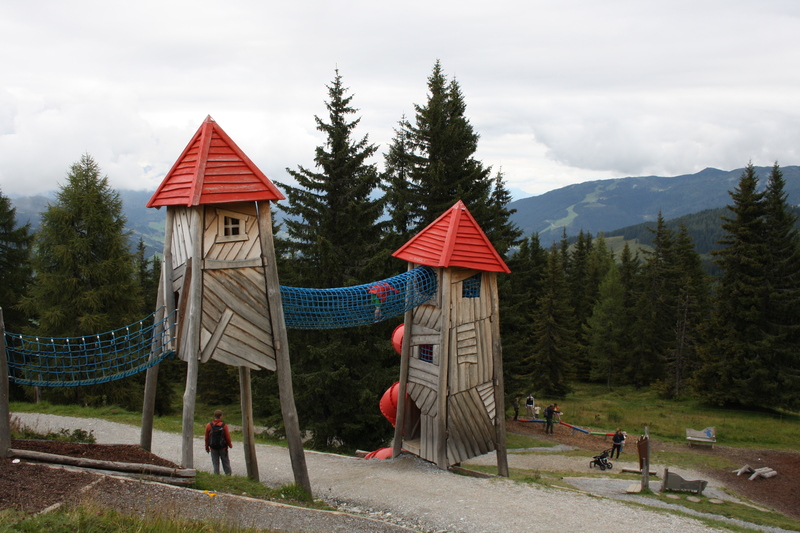 One of the play structures on top of the mountain at the Geisterdorf. Sankt Johann-Alpendorf, Austria. Day 22: Woke up in Ljubljana, Slovenia. We wandered around the city center, to their central market, and an old Roman wall. In the evening we drove out to Lake Bled and took a row boat to the famous church on an island before taking the long drive back to Munich. The Franciscan Church of the Annunciation in Ljubljana, Slovenia. Day 23: A much needed sleep in back in Munich. Then our friends watched our kids so that my husband and I could climb on the roof of the Olympiastadion in Munich’s Olympia Park then zip line across the stadium field. Dinner that night at a delicious Augestiner Bräuhaus. 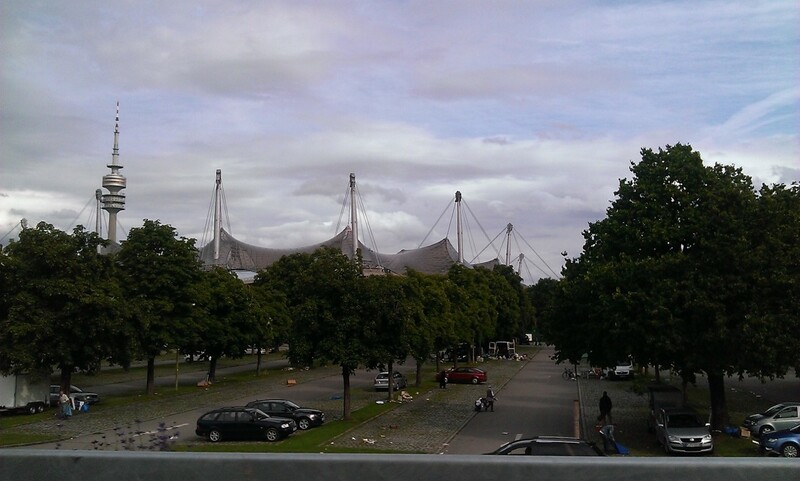 The Olympiastadion (Olympic Stadium) in Munich where we climbed on the roof. Day 24: My husband got the day to himself to go visit his friends. The three kids and I spent the afternoon with some of my friends at two biergartens in the Englischer Garten (English Garden). First near the Kleinhesseloher See (a small lake) then at the Chinesischer Turm (Chinese Tower). The Chinese Tower biergarten completely remodeled their playground! 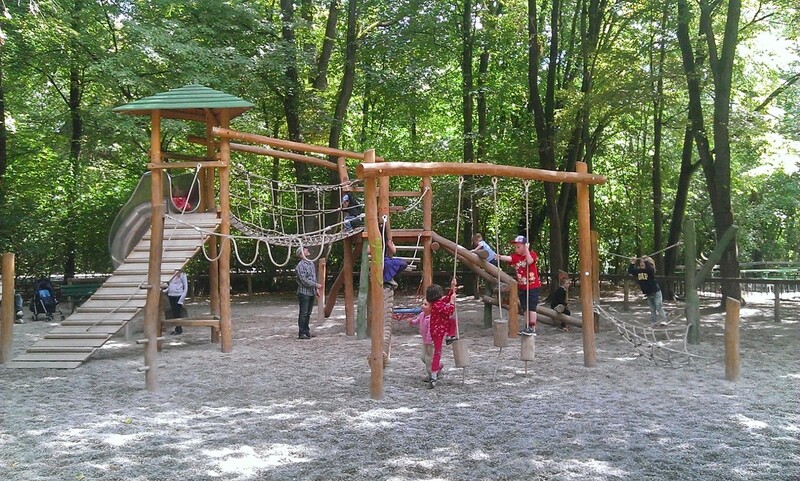 The new playground at the Chinese Tower Biergarten in Munich’s English Garden. Day 25: It was time to say good-bye to my husband who was flying back to the US that morning. The two boys went to a German/English day camp at Gymboree while Madelyn and I saw my husband off at the train station. 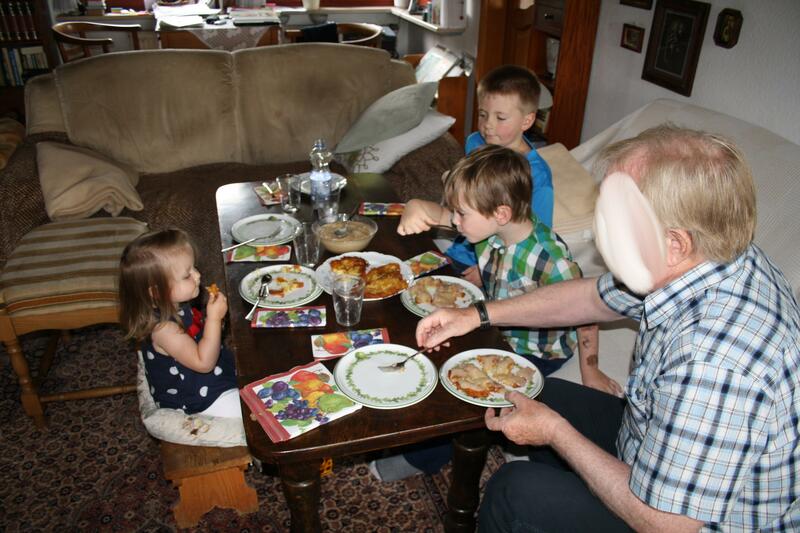 Then all the kids went to a German friend’s birthday party! 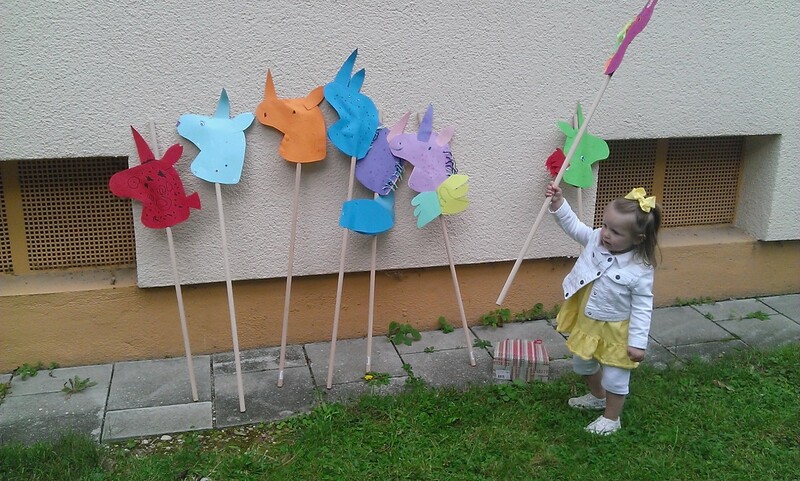 The unicorn craft that the birthday party entertainer had the kids made at our German friend’s birthday party. Day 26: The boys had another day at the Gymboree camp. 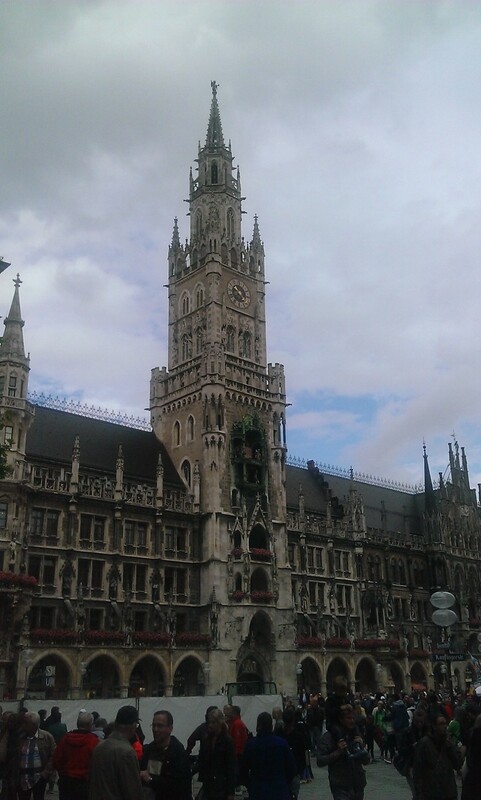 I took my friend to the doctor then had a walk through Marienplatz, shopping at the delicious Dallmayr deli/market. Later that afternoon we met some friends at the Natural Science Museum at the Schloss Nymphenburg. 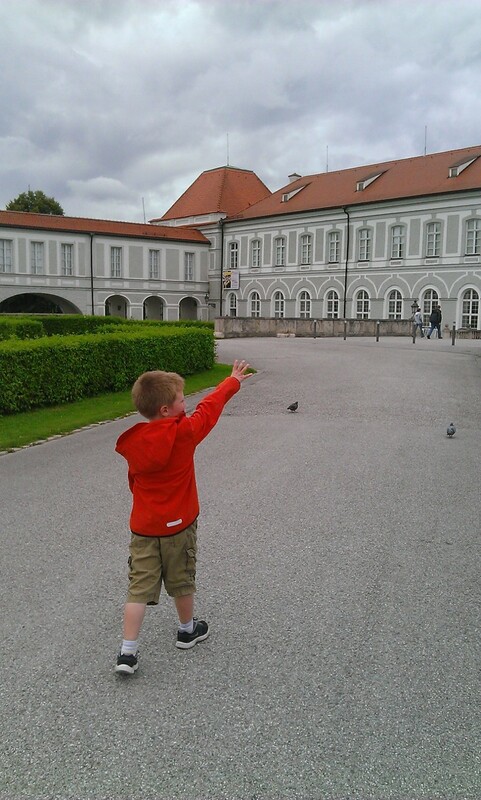 Heading to the Natural Science Museum in the Schloss Nymphenburg. Day 27: Our last full day in Europe. The boys did one last day of camp at Gymboree followed by some play time during their open gym with a friend and her daughter. 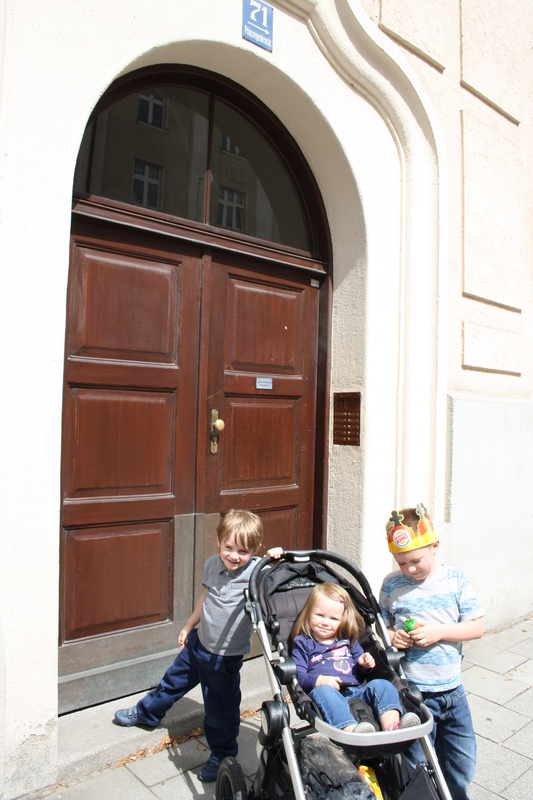 Then she blessed me by watching my 3 kids for a couple hours so I could have a few moments to myself in Munich’s city center before the long trip home alone with the 3 kids. That night we took a late train to Frankfurt to stay the night in preparation for our flight back to the US the next day. The Neues Rathaus in Marienplatz. Munich, Germany. Day 28: Woke up in Frankfurt and had a nice German breakfast at the hotel. Took the tram and train into the airport and flew home on Condor Air. 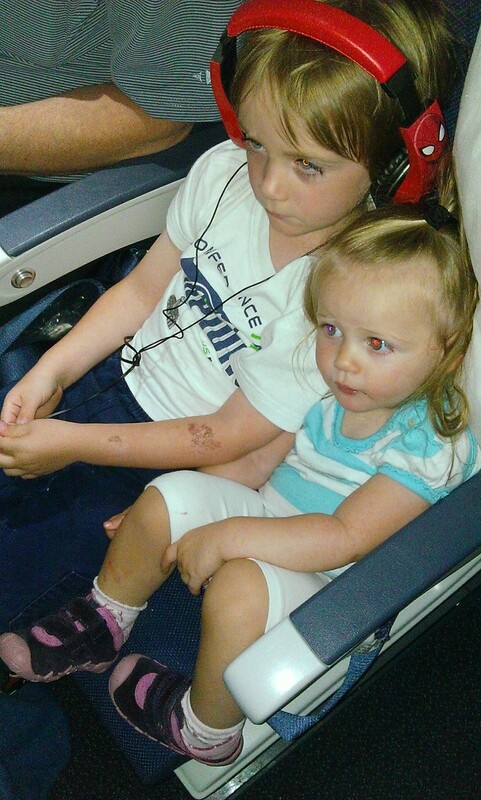 My 4 year old and my 18 month old watching a movie together on the plane. And there you have a snap shot of our month in Europe! More detailed post of the best parts of the trip with kids to come! ← Condor Airlines, Worth A Try With Kids?